It’s not like the signs weren’t there. 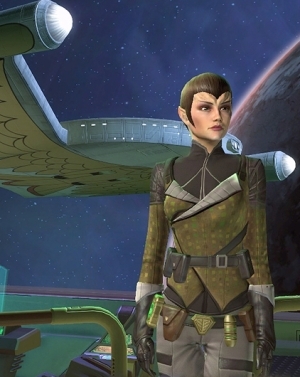 Players have been asking for a Romulan faction ever since the game launched, Denise Crosby recently came in to record voiceovers, and the last major update was all about building New Romulus. Still, the announcement of STO’s first expansion, Legacy of Romulus, is pretty exciting for the Trek faithful. It remains to be seen how fleshed-out the Romulan content is. Players have been dubious of a Romulan faction because the Klingon PvE content has never been up to snuff yet. But now it looks as though you’ll be able to roll a Klingon from level 1, so I guess Cryptic’s figured out a way to give enough missions to each side. The improved UI, oddly enough, is the other thing that’s grabbed my attention. I’m all about making games look and handle better. STO’s UI isn’t horrible, but it can be cluttered and sometimes not as user friendly as it should be. So good on STO for breaking the warp-expansion barrier. It’s a nice sign of a healthy game, and it’s definitely rekindled my interest in playing it. B-but Klingon birds of prey are green too! I’m so confused. The prospect of playable Romulans almost makes me want to give ST:O another shot. I’m disappointed not to hear your commentary on the Romulan version of tipsy space elf. Romulans have always been my “thing” in Star Trek. I was really disappointeed when they dropped out of the original release, this may be what gets me back into playing the game. Although I already have TOR, TSW and GW2 sitting on my desktop and I pnly really spend any time in TOR.